Heard there were some serious horse events going on near us, and went looking. We discovered one of the biggest horse events in the country is happening right here right now! HITS Ocala is a two-month series of hunter-jumper events that draws over 2,000 horses and their riders to compete for many, many thousands of dollars in prize money! Oh, today was their day off, because Sunday is always the biggest day. Show horses inside, under cover. No photos. Did a little research….oh brother, we’re gonna have to stay here for another month! Did you know the most recent Triple Crown winner, Affirmed, was bred and raised in Marion County where Ocala is located? You must have been aware that Ocala is well known as the horse capital of the world. 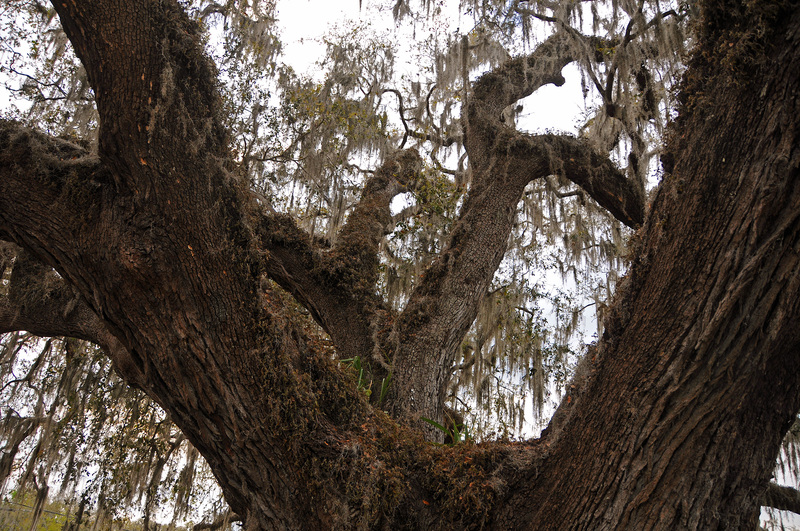 Other surprises: Wiki makes the claim “unofficially, Ocala is known to have more cloud-to-ground lightning per square mile than any other city in the world.” And nearby are the headwaters of the Silver River, the largest artesian spring formation in the world. Wow, what a place! We have a lot of ground to cover in just a few weeks…. Our high today for just a minute was 56! Down to 31 tonight! I realize the rest of you are much lower, but you’re not in Florida, so you’re supposed to be cold! Did some driving. Tried to catch an unusual ferry boat just a few miles from our park, but waited 30 minutes to get the operator’s attention on the other side and finally gave up. Sun came out so we drove to St Augustine. Good idea! Too cold to walk around, and pretty crowded on a weekend….but we were reminded why we enjoy the city so much, and took mental notes of the places we’ll visit for sure when it’s warmer again in a few days and we come back! St Augustine is a town that is up close to you. Whether you cross the Bridge of Lions coming into town from the beach or pass the lions on your way out of town toward the beach, everything is almost within arm’s reach. It sure helps to have the Lil Taxi! We stopped several times so the boys could walk, and one place we chose was in the shadow of the St Augustine Lighthouse. We were tempted to climb the tower, because they’ve restored it to such a level that it’s safe to walk around the outside of the light at the top! 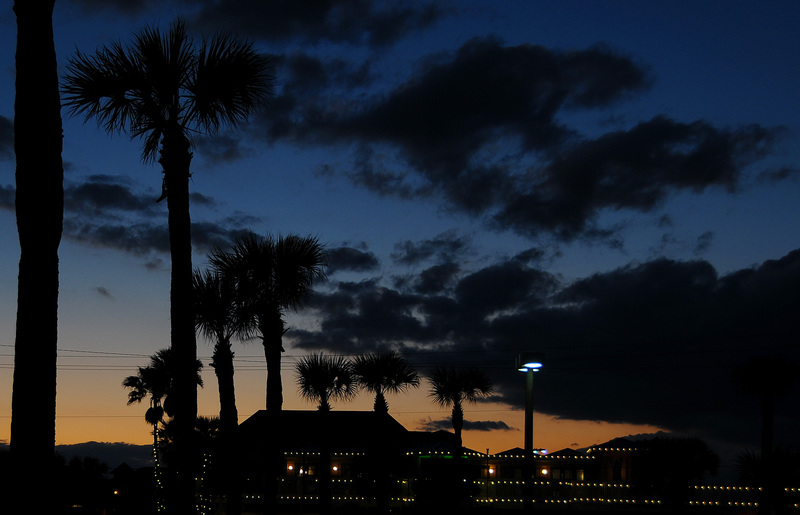 As we finished our tour of the city for today, and I was regretting the lack of sunset over the ocean, I realized the sunset was still unusual for most of the country because of the silhouette of the palm trees. Palm trees always make it seem warmer, and it was already down to 47! Took a day trip today, south and west a bit, touring past a host of inland lakes. Surprisingly, some fairly large ones have simply dried up. Interesting to see the diversity of landscape and human habitation. We ranged from Ocklawaha Prairie Restoration Area, down through Emeralda Marsh Conservation Area, past Leesburg, and past Eustis. 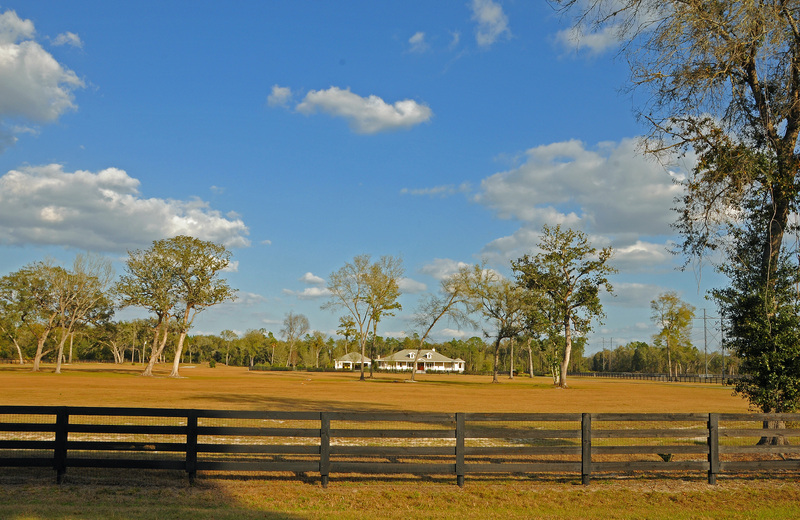 There were numerous farms with large, wide-open pastures for cattle and for horses. Many smaller farms had goats in their fields. 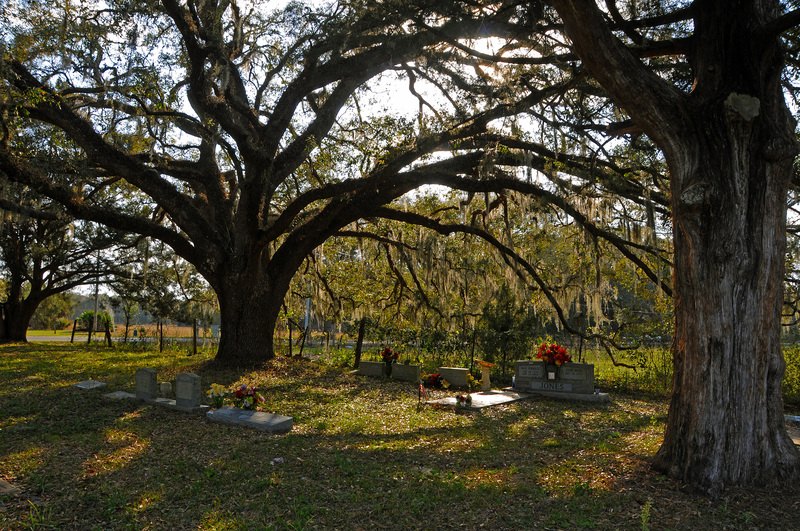 The cemetery pictured here seemed particularly suited to its task, with the huge live oak trees and their Spanish moss providing a brooding kind of shade for the headstones. 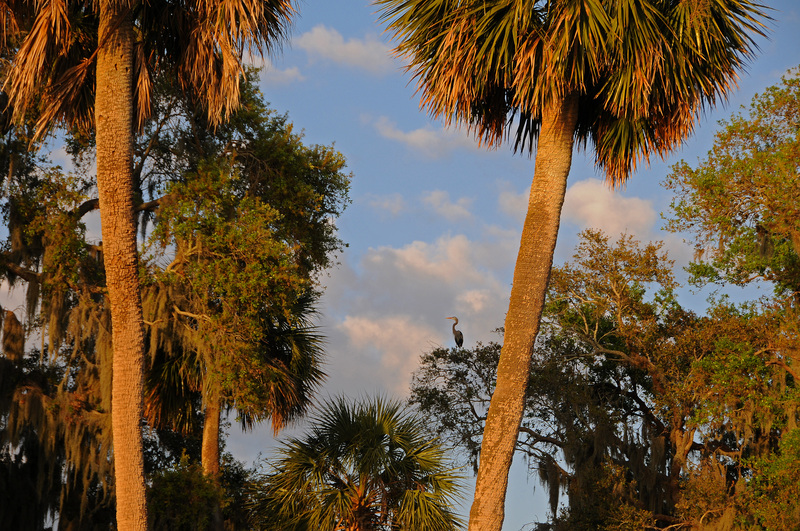 With the evening sun making its last effort, we drove out onto a point of land in the middle of Lake Griffin, and promptly spotted the heron in the tall tree, a horned owl that moved much too soon for a photo, and likewise a bald eagle. Just as we turned to leave, Robyn noticed the two logs near shore were moving! I managed to catch just the snout of one before they both submerged…. Robyn took the Nikon again this morning, and ran across some Osprey action…. Let’s just say, we should expect some eggs to be laid shortly. A picnic today! 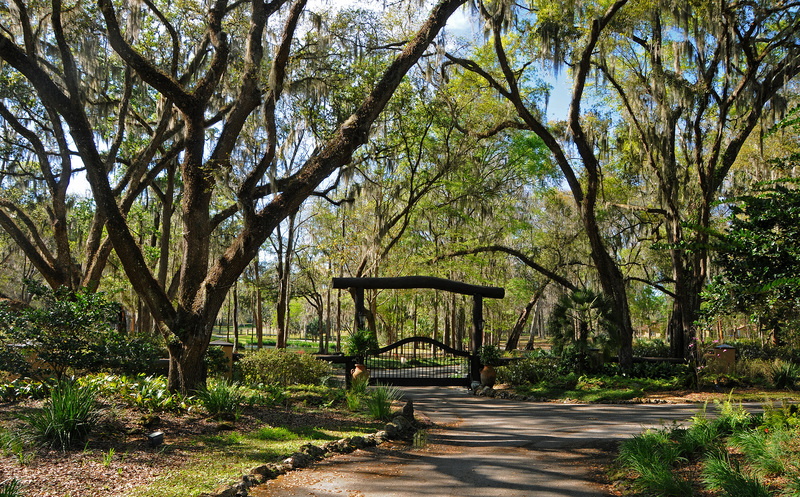 We picked up wonderful Greek food in Deland, and found this lovely park and covered shelter just a block away. And oh my goodness, it’s across the street from our newest favorite place: Buttercup Bakery! And best of all, Marion met us there following her morning farmer’s market just up the road! So the twins had two nice ladies with them for lunch, hence “beauty” in the headline. And no, I’m not the “beast”. Look at that tree. It’s the Beast. We have passed it countless times since we’ve been parked at Salt Springs. Finally stopped to take its picture, and spent a little time this evening researching it. Learned several things. 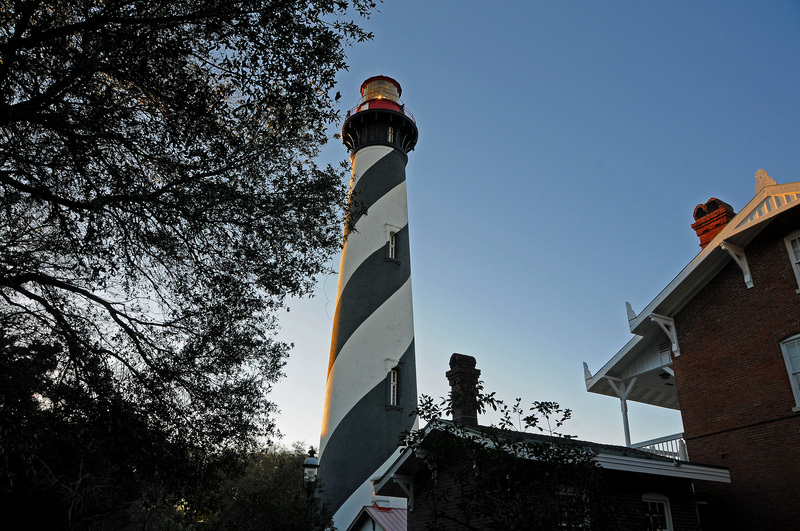 First, it’s located in the community of Volusia….which is the second-oldest European settlement in Florida, after nearby St Augustine! 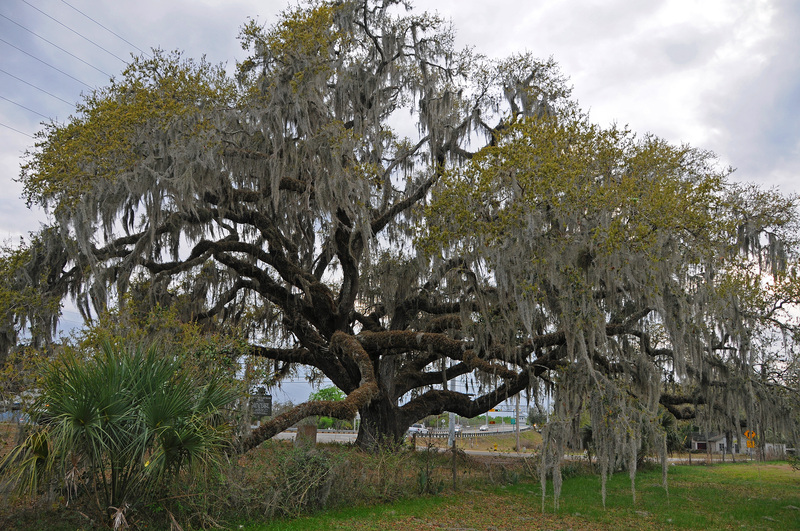 Second, this tree is a southern live oak, as are probably all the live oaks around here….but this one is pictured first on the Wikipedia page for its scientific name: Quercus virginiana! We’ve been blowing through this little burg without a clue about its place in history! Robyn took the Nikon this morning…..
Each morning for the past week or so, this lovely boil has been shrouded in steam because the night temperatures have been in the 30s while the water coming out of the spring is 72 degrees. On the short walk across our campground to the boil….and in its waters or overhead….Robyn has seen bald eagle, osprey, anhinga (look that up! 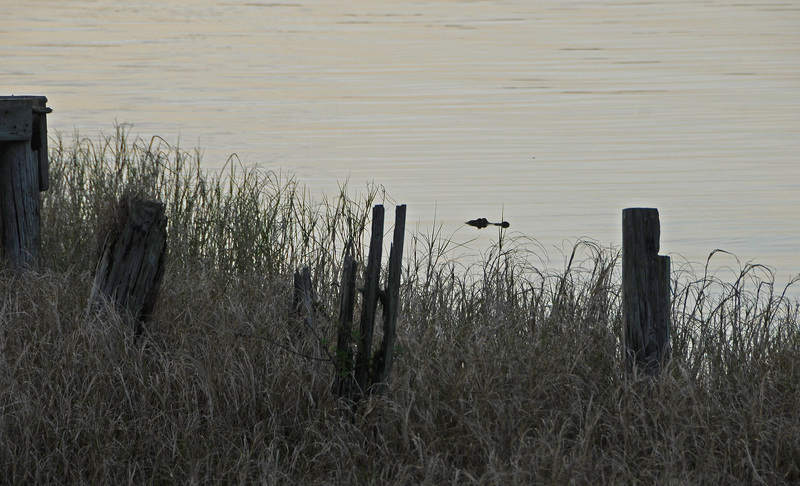 ), otter, manatee, heron, wild turkey, black vulture, and other more common animals. What a little Garden of Eden! And the dogwood is in bloom out the window of our coach! 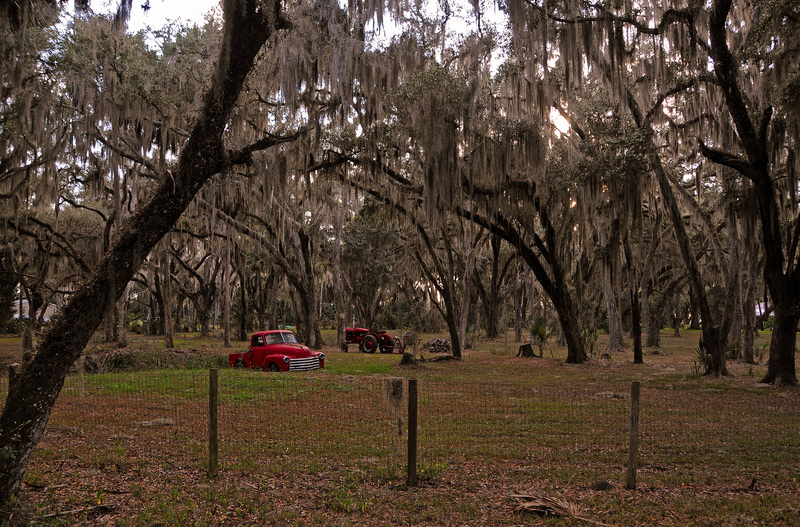 This campground is soooo unusual for a federal park….we can stay on this site until April 15 if we want. We keep paying for a week at a time….wondering if the weather will get too hot or too humid to be comfortable, or if we’ll have to saddle up and run to Dayton for a February 26 appointment with a nursing supervisor. 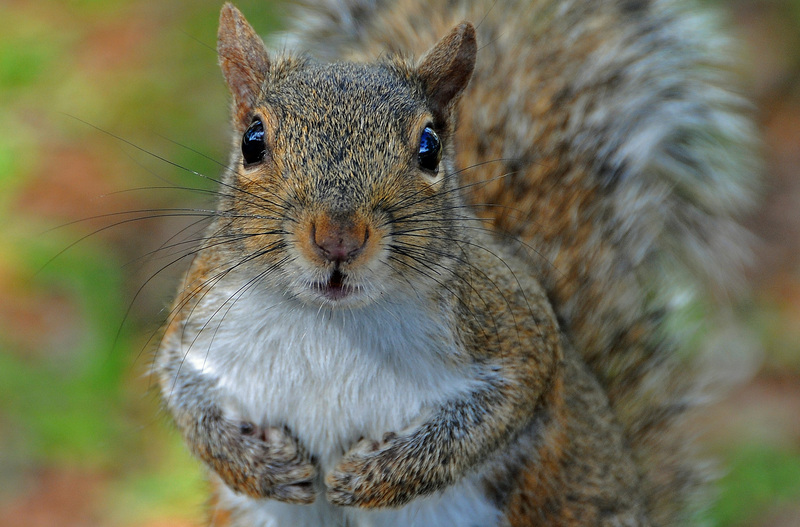 Shucks, don’t have to make those decisions today…………. This little fella has been a constant companion around our coach. Each morning we step on the cracked nutshells he leaves on the lower step of the coach from breakfast. He’s not tame, but he’s pretty acclimated to a coach under his trees and people coming and going. In this picture, he had climbed up onto the picnic table where I was sorting and consolidating boxes of stufffffffff. I’d kept the camera close because he’d been hanging around.